The mystery and romance of Venice in the evening inspire awe and wonder. 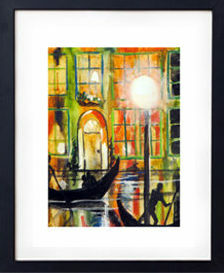 Enter a world of ancient beauty as you travel along the Grand Canal of Venice in the lamplight. As you sail toward Piazza San Marco (St. Mark’s Square) you will hear the sounds of beautiful live music serenading you from the cafes, see the local artists selling their creations on the walkways, and listen to the songs of the gondoliers. Join Sharon Hofer as she guides you step by step in creating this enchanting Italian scene. Such a unique scene deserves a unique media to capture it. This project is made with Gouache. It is easy to use and the opaqueness provides a unique and special look for your masterpiece.